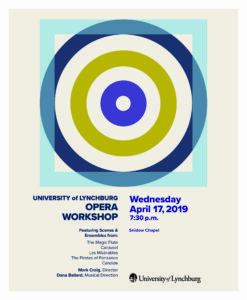 The University of Lynchburg’s Opera Workshop Ensemble will hold a concert at 7:30 p.m. Wednesday, April 17, in Snidow Chapel. The concert is free and open to the public. The group, directed by adjunct faculty member Mark Craig with musical direction by Dana Ballard, has been together for nearly a full academic year. It had four students in the fall, but has doubled in size since then. Music from classical operas and American musical theatre will be featured in the concert. The audience will recognize many familiar songs. “The concert promises to be a great opportunity for new concert-goers to get a taste of both opera and musical theatre, and also for those who long to hear some old favorites,” Craig said. The concert will include music from “Candide,” an American opera composed by Leonard Bernstein; “Carousel,” by Rogers and Hammerstein; “The Magic Flute” and “The Marriage of Figaro,” by Mozart; “Kiss Me Kate,” by Cole Porter; “Getting Married Today,” by Stephen Sondheim; “Hunchback of Notre Dame,” from the Disney musical and adapted from the classic French novel; and others. Craig will tie all of the songs together with narration and will provide translations of foreign songs.